List Rules Vote up the best responses to interview questions. Hollywood may be the land of make-believe and celebrity interviews might often be nothing more than shameless self-promotion and fluff, yet on rare occasions, some performers have been known to give fiercely honest answers to interview questions. This is partly because, quite often, actors are on interminably long press junkets when they're promoting projects and get asked the same inane questions over and over. Just look at Lady Gaga's "100 people in a room" monologue. But once in a while, actors are naturally going to slip off script - sometimes during particularly awkward celebrity interviews - and answer a question with unexpected honesty. In a way, it's refreshing to hear a celeb share real talk and not the media-friendly tripe their publicist is pushing. 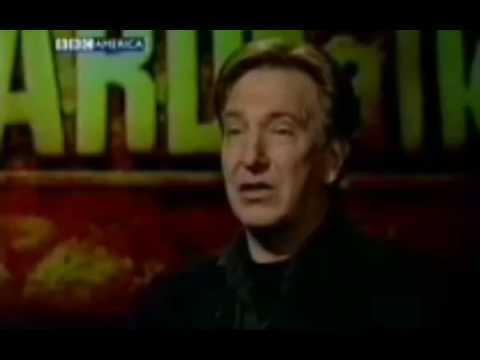 During a 2001 interview with the BBC's HARDtalk, Alan Rickman was asked if the Harry Potter films are "worth the hype." "Well," he responded, "it's worth any amount of hype to get children to read again." Curiously, the quip has been edited out of the video above, but you can see the full exchange in the "Alan Rickman" episode of BBC Two's Talking Pictures. At the 2017 Save Our Schools march in Washington, DC, Matt Damon was asked a remarkably inappropriate question by a camera operator: "Aren’t 10 percent of teachers bad though?... Ten percent of people in any profession maybe should think of something else." Damon, who was standing beside his school teacher mom, answered, "Maybe you’re a sh*tty cameraman." In 2015, Jason Momoa was questioned about whether he considered himself a feminist. "I wasn’t raised by a man. I was raised by a single mother my whole life," he responded. "It’d be ridiculous for me to say that I didn’t believe in it. They’re the strongest beings in the world." At a press conference for The Avengers in 2012, Scarlett Johansson, sitting next to Robert Downey Jr., was asked if she had to diet or eat specific foods to prepare for playing Black Widow. She turned to Downey and said, "How come you get the really interesting existential question, and I get the rabbit food question?" She then gave a quick, clearly irritated answer: "Uh, yes…you're training and doing all that stunt work, and so you eat a lot of green things. Next question."